This reminds me a bit of Paul who acknowledged his departure was at hand and spoke words that ring of hope. “I have fought the good fight, I have finished the race, I have kept the faith. Now there is in store for me the crown of righteousness, which the Lord, the righteous judge, will award to me on that day—and not only to me, but also to all who have longed for his appearing” (2 Timothy 4:7-8). God’s faithfulness to us is so great that we have bright hope for tomorrow. 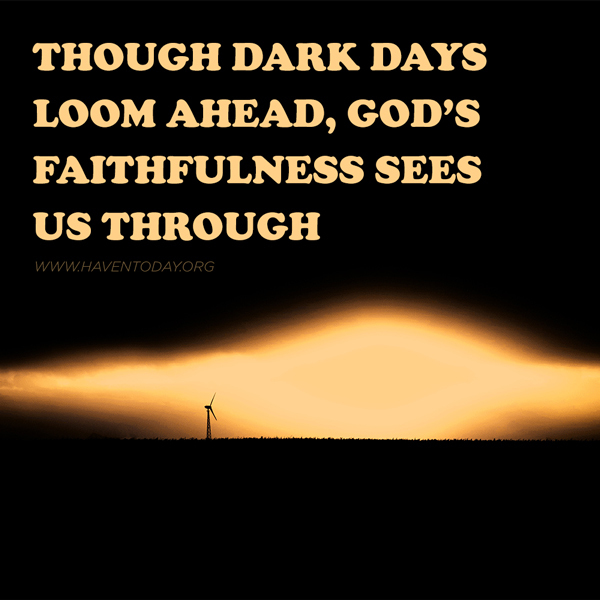 Though dark days loom ahead, His faithfulness sees us through. For all who place their hope in the atoning work of Jesus, He promises to carry us safely home.